Reliance Mutual Fund is a leading Asset Management Company in the mutual fund industry that is seeing immense year on year growth. The next step was to bring the concept of investment alive on social media in an otherwise pedantic industry in terms of social and digital content, with most competitors focusing on transactional messaging. With the aim of increasing the fast-growing yet low penetration of the Mutual Fund industry in India, the ask was to showcase the benefits of mutual funds across life-stages of potential investors and help them understand the dreams and ambitions they can achieve in a planned manner with their investment appetite. Wealth Sets You Free – An articulation of ambition, growth and success was executed through a landing page that achieved the objectives of helping people understand their risk profile basis their investment approach, achieving their long term goals with their investment appetite and life stage as well as engage with them through a highly visual and uncluttered medium by planning a bucket list that defined their goals and dreams. The website helped people plan their investments by using their most desired and seemingly impossible goals through a simple yet effective calculator with the results and investment plan being customized for them in an email to enable achievement of their dreams. The highly visual and shareable nature of the website helped people plan for their specific investment and life goals with over 1500 and counting customized investment plans created. 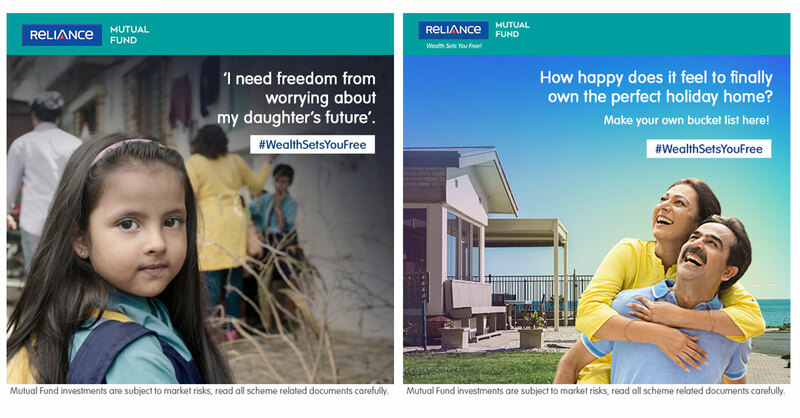 Reliance Mutual Fund stands for Making India Prosperous. To that end, the creative and visual communication serves the objectives of knowledge by demystifying Mutual Funds, social connect by being relevant during festive occasions when people invest, topical content and conversations to help people achieve their goals, and performance of various funds to help potential investors select a fund of choice.